Ryman and his team of assistants built their enormous parody of roses in stainless steel applied over wire mesh and covered with fiberglass resin and nidacore. They were raised high off the ground on PVC tubes and colored with automotive paint. The industrial flowers made me happy. The simple incongruity helped me see the city better since the color popped against the limestone and brick facades and the roses re-articulated the street wall of Park Avenue buildings. The installation wasn’t punishing and didn’t beat anyone over the head which was lucky since Ryman’s original presentation to the Department of Parks and Recreation involved black roses and enormous sculptured trash—Doritos bags, coffee cups, and matches—as a satire on the privilege of that part of town. I’m glad that didn’t happen since it would have been a scolding cliché. The Roses looked over Park Avenue for four months and no one got tired of them. They existed like a set of jumbo props, creating with the changeable weather a changing mise-en-scène and their absurdity was large and gentle. Ryman’s three new installations, entitled (as a group) Anyone and No One at the two Paul Kasmin galleries (515 West 27th Street and around the corner at 293 Tenth Avenue) function, again, like lavishly executed props and stage setting (or even stationary puppets). They take up nearly every square inch of the two white box galleries in Chelsea. Like the artist Charles Simonds (whose work is miniature rather than gigantic), Ryman delights because he likes to play and there’s nothing wrong with that. When you see the work you feel the kind of excitement that comes when a theater curtain’s raised and you clap because of the ingenuity of the set design and the trick of illusion—prestidigitation. Bird apparently grew out of a nine and a half inch model but now it’s 12 feet by 15, and 4000 pounds and made out nails, hand fabricated and forged to produce a clean but industrial finish (some of the nails are five feet long). 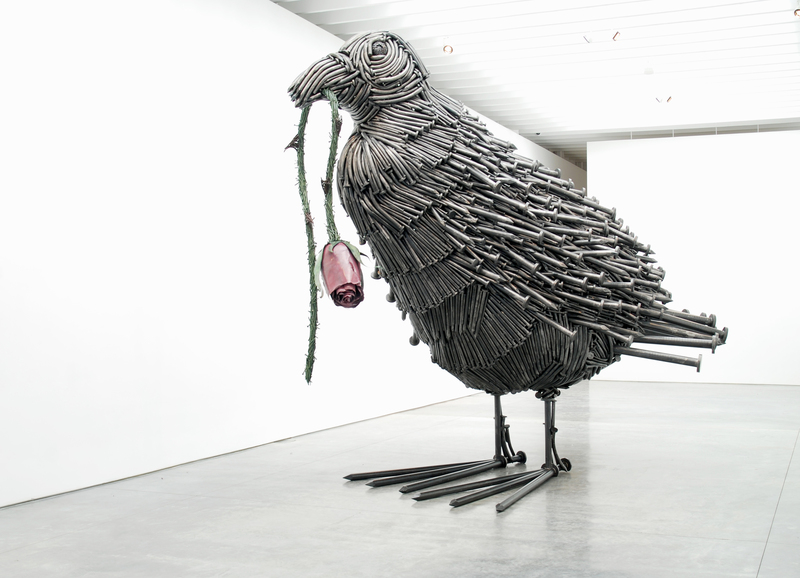 It stands alone on the gallery floor with a rose sprig hanging from its beak and generates whimsical contradiction—an organic subject built from factory material, a creature that hardly reaches above your ankle but now as tall as a small house, gigantic nails simulating down and plume. Interestingly the contradictions are not menacing (like Méret Oppenheim’s Fur Lined Teacup) but wonderful in a non-aggressive though monumental way. I can’t help but wish someone will step forward to purchase the piece for a museum so it will have an extended life. The third part of the installation is actually four separate sculptures constituting a maze that’s built from stacked paintbrushes. By re-arranging the brushes, Ryman manages to change surface textures so that part of the maze looks like coral reef, part like the surfaces of sea caves, and part like rain forest. Like all of Ryman’s new work, this is meticulously produced, with attention to detail and precision in execution, reorienting the viewer through play with scale. A paintbrush, of course, is only eight or nine inches long but two hundred thousand paintbrushes, stacked to the ceiling, can make you feel as though you’ve entered a Brobdingnagian universe. Are you kidding? bird, flowers, insects – next kittens and puppies. Living off his name.